Barbican Art Gallery’s new exhibition Radical Nature celebrates the relationship artists and architects have had with the environment over the last 40 years. It brings together the work of 20 individuals or groups of artists and architects. We see some of the pioneers, whose work grew out of environmental concerns arising from the social and political upheavals of the late 1960’s and the oil crisis of the early 1970’s, to contemporary artists and architects who are picking up the baton of those debates due to the increasing climate crisis facing our planet. 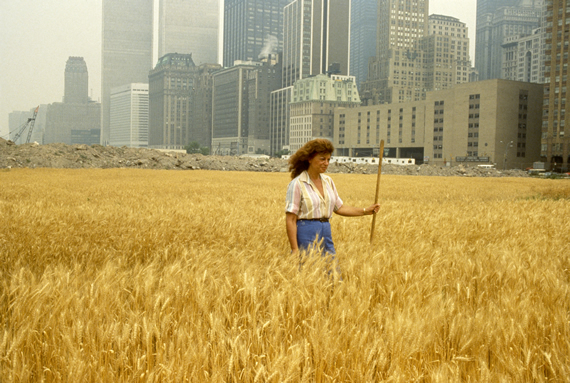 It’s a wide-ranging show which includes an extensive programme of events and a number of projects in East London, including recreating Agnes Denes’ Wheatfield – A Confrontation, originally grown in the Battery Park landfill in New York in 1982. The aim is to “map how artists and architects have engaged with ecological problems since the 1960’s”, but the result is something of a curate’s egg. Interspersing the works of the pioneers with more contemporary pieces throughout the exhibition works well as it shows good concepts do not age with time. Some of the more interesting works are located within the central space of the gallery as you enter, once you have made your way past Mark Dion’s Wilderness Unit – Wolf (2006) – a modern interpretation of the traditional museum’s stuffed animal. 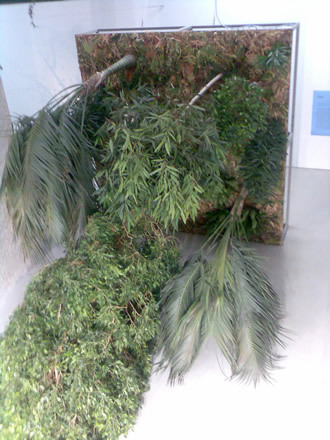 These include Hans Haacke’s Grass Grows (originally created in 1969) and Henrik Håkansson’s Fallen Forest (2000) – a recreated 16 meter-square patch of rainforest flipped onto its side. Both works seek to bring nature directly into the gallery to challenge how we relate to the natural environment. On the other hand, Newton and Helen Mayer Harrison’s work, Full Farm (1972) asks questions. 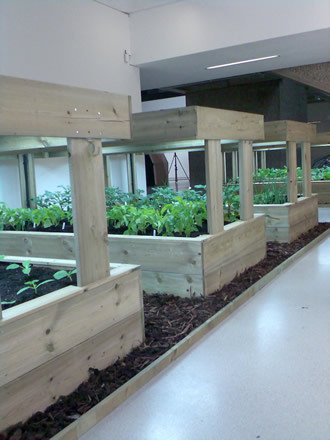 Growing food within a gallery might be the result of the artists’ desire to make works that benefit the eco-system: will we all have to start growing food indoors to feed an increasingly urbanised world? There is a timber geodesic dome in this central space which provides a tranquil place to sit and watch Buckminster Fuller’s 1976 film Modelling Universe, on stools made from recycled elements from the previous Le Corbusier exhibition held at the Barbican, while he explains how he discovered the structures to make geodesic domes through experimenting with real physical models started in the late 1940’s. Fuller saw these as stepping stones in a process of technological advancement which would allow society to do "more and more with less and less until eventually you can do everything with nothing”, in an attempt to increase the standard of living for an ever-growing population despite the finite resources of the Planet – Fuller termed this process ephemeralization. This contrasts nicely with the architectural work of R&Sie(n), located in an alcove close by. Unlike Fuller, whose work tried to discover universal truth which recognised “change is normal”, R&Sie(n)’s designs for “termite-shaped buildings” seem trapped in a virtual world, derived from the possibilities and constraints of 3 dimensional computer aided design programmes rather than responding directly to society’s context. Walking around the exhibition is like moving through a 3-dimensional catalogue. Many of the works allow you to observe but you are prevented from being actively involved. 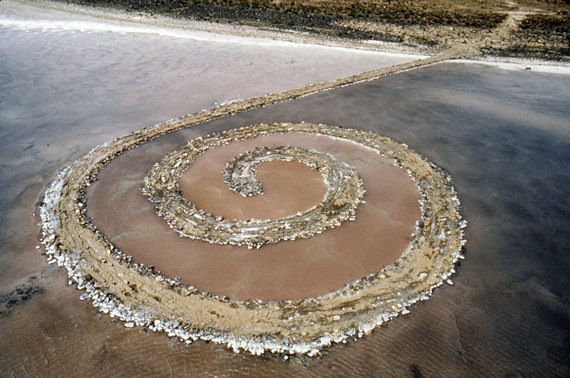 An example of this is the film of Robert Smithson’s Spiral Jetty earthwork intervention into Great Salt Lake in Utah (1970). Watching this film, showing the work of one of the most prominent figures of the Land Art movement, raised for me the perennial problem of how you communicate Land Art works within a gallery space. As with the film about Diller Scofidio & Renfro’s recent fog mass structure on Lake Neuchâtel Switzerland (2002), you watch (in an isolated alcove), as a passive observer of what has gone before, a pale substitute for experiencing the real thing. One is left wondering about the nature of art – is it the film, is it the installation or both? Lara Almarcegui’s exploration of the “natural processes of decay, transition and entropy” in empty spaces within the Lee Valley which will be swept away by the 2012 Olympics raises another issue which affects a number of the works within the exhibition. Almarcegui records that one of the spaces, Old Ford Lock, had been the home of Ron Rowen (ex-fireman and Navy veteran) for 42 years before he became the first victim to be evicted for the Olympics. Almarcegui records this event, acting as an archive as it were, but passes no comment on the injustice of this. This archival role is also present in the works of the Centre for Land Use Interpretation’s visual record of The Trans-Alaska Pipeline. Artists might suggest that it is up to us, the observers of their works, to make the appropriate conclusions or undertake appropriate action. Radical Nature provides an interesting overview of the relationship between art and architecture with the environment over the last 40 years. But it is disappointing to see artists and architects failing to engage politically in their work, only observing rather than offering solutions. This passive role of recording observations contrasts sharply, for example, with the interventionist approach taken by artists like Alexandr Rodchenko and Liubov Popova, as seen in their recent exhibition at Tate Modern or today, organisations like Architecture San Frontières. Rodchenko and Popova came to the conclusion that their art needed to intervene pro-actively in society to support the ideas of the October Revolution in Russia. Architecture San Frontières have recently lent their expertise to help former homeless people to create a garden for the Chelsea Flower Show – surely a first! It would be nice to see a growing numbers of artists and architects intervening to support the radical solutions needed to deal with the climate crisis facing the planet. Radical Nature: Art and Architecture for a Changing Planet (1969 – 2009) is at the Barbican Art Gallery until October 18.